The following procedures describe how to work with Debug Mode in Zend Studio. Debug Mode allows you to listen in on URL requests to a specific Zend Server, without initializing a debugging session from within Zend Studio or using the Zend Debugger Toolbar. It is recommended to use Debug Mode for development purposes. Using this feature in a production environment, will trigger a significantly large amount of debugging sessions in your workspace. This procedure explains how to turn Debug Mode on for a Zend Server. By default, Debug Mode is turned off, and after being enabled, is turned off again when closing Zend Studio. From the Menu-bar, select Window | Show View | PHP Servers to add the PHP Servers view to your workspace. In the PHP Servers view, right-click your Zend Server, and select Start/Stop Debug Mode. Debug Mode is initialized or stopped, and the Zend Debugger begins or stops to monitor requests to Zend Server. 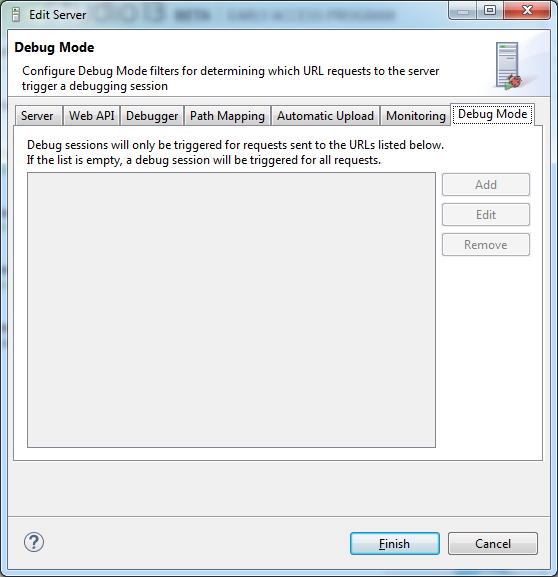 Debug Mode	can be only be enabled once for any particular Zend Server. If a different Zend Studio user wishes to enable Debug Mode for the same Zend Server, he will be notified that an active Debug Mode is already in session. If he selects to proceed, Debug Mode settings are reset, and his Zend Studio begins to operate in Debug Mode. 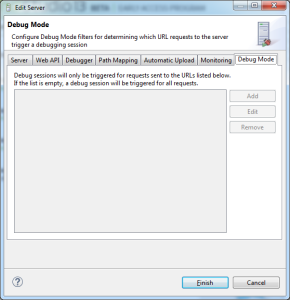 This procedure explains how to instruct the Zend Debugger to initialize debug sessions in Zend Studio for particular requests according to URL filters. If no filters are defined for a server, debugging sessions are initialized for all requests made to the server. In the PHP Servers view, double-click the server you wish to initialize debugging sessions for. The Edit Server dialog is displayed. Select the Debug Mode tab. The Add Filter dialog is displayed. Enter the URL you wish to filter, and click OK. The filter will appear in the filters list. Debug Mode will only initialize debug sessions for the defined URL filter. Leaving default settings will instruct the Zend Debugger to initialize debug sessions in Zend Studio for requests made to all target URLs.